I’ve been leading my school in implementing BYOD for students for a few years now and one of the things we have noticed in our ongoing evaluation is students need technical support (eg. help in connecting their devices to the school wifi) and learning advice (eg. which apps to use for notetaking and for particular ways of presenting information for assignments) when they are bringing their own devices for schools. While many teachers believe that students are digital natives, we have noticed that many students are not as naturally competent and confident in using technology for learning as we think they are. Many students know how to use devices for social purposes but when it comes to enhancing their learning with their own devices, they need teachers to guide them. However, a major challenge is that teachers are also on the same learning journey as students. With BYOD, a teacher faces a large array of types of devices so it is a huge challenge to provide technical support or to be an expert in the thousands of apps that are available for students to use. To meet this challenge, I’m currently experimenting with the Student Technology Help Desk. This is a service where students drop into a classroom at a certain time each week and get technical support or learning advice for BYOD from me and student digital leaders (who are trained to be tech-savvy). It is sort of like a Genius Bar. At the moment the Student Technology Help Desk is opened for 30 minutes a week and it every session has been non-stop from beginning to end. Staffing the help desk is me and three other students. There is a roster of which students staff the help desk so that each student gives up their time a maximum of twice a term. So far most help requests are for connecting devices to the school wifi, setting up Google Apps on devices and advice on apps to complete class tasks and assessments. So far it is working well and I think it’s a great way for help students bring their own devices to school and also a great learning opportunity for the student digital leaders. Do you have BYOD at your school? 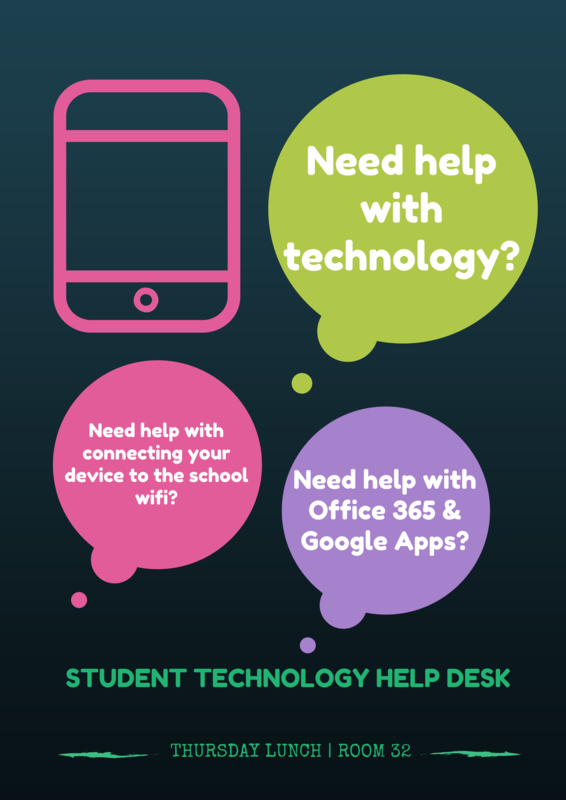 Why not set up a Student Technology Help Desk as well? Great idea Alice. I too have noticed that the students are not as “tecchy” as we assume they are. This also enables them to be more responsible for their learning and how to help themselves.